1 1 Werner Bier and Per Nymand-Andersen European Central Bank, Directorate General Statistics CCSA Special Session, Luxembourg, 8 September 2011 Communicating. 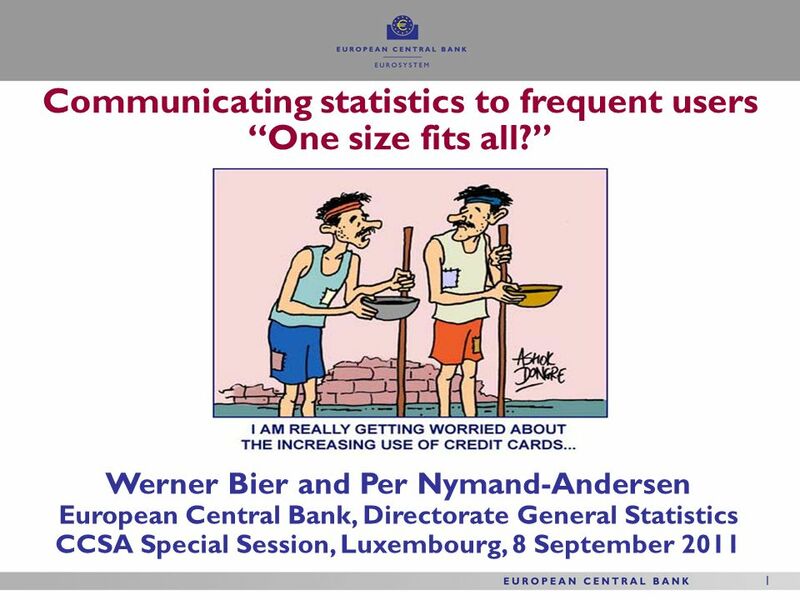 1 1 1 Werner Bier and Per Nymand-Andersen European Central Bank, Directorate General Statistics CCSA Special Session, Luxembourg, 8 September 2011 Communicating statistics to frequent users One size fits all? 5 5 5 Extracting relevant statistics in context (What?) Form of communication, using users language (How?) Further explore existing communication channels (Which?) More focused market segmentation (Who?) One size fits all ? Who are our frequent users ? 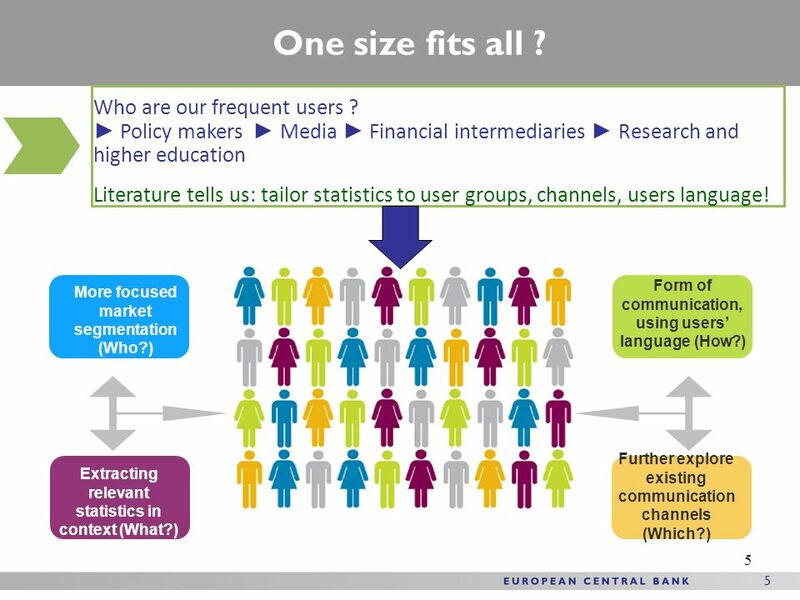 Policy makers Media Financial intermediaries Research and higher education Literature tells us: tailor statistics to user groups, channels, users language! 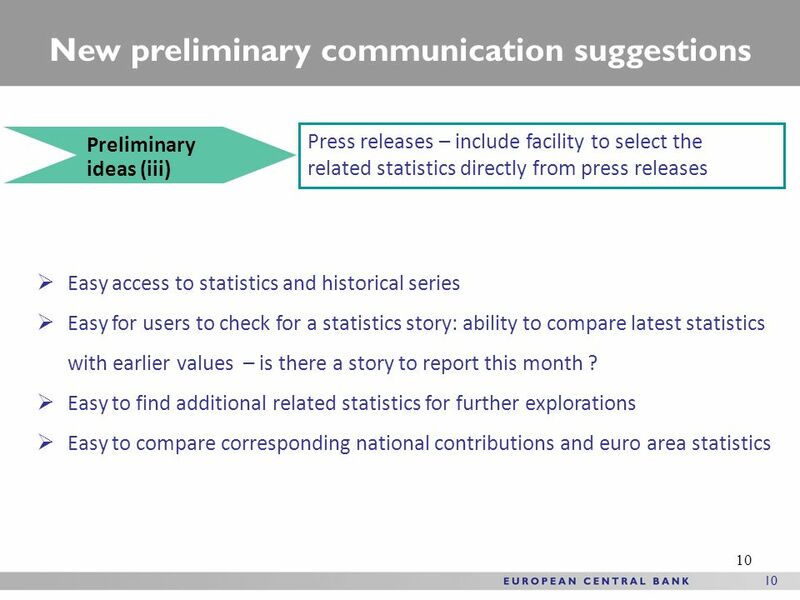 8 8 8 New preliminary communication suggestions Preliminary ideas (i) Facilitate the access of official statistics by data vendor (Bloomberg /Thomsen-Reuters /Haver analy.) 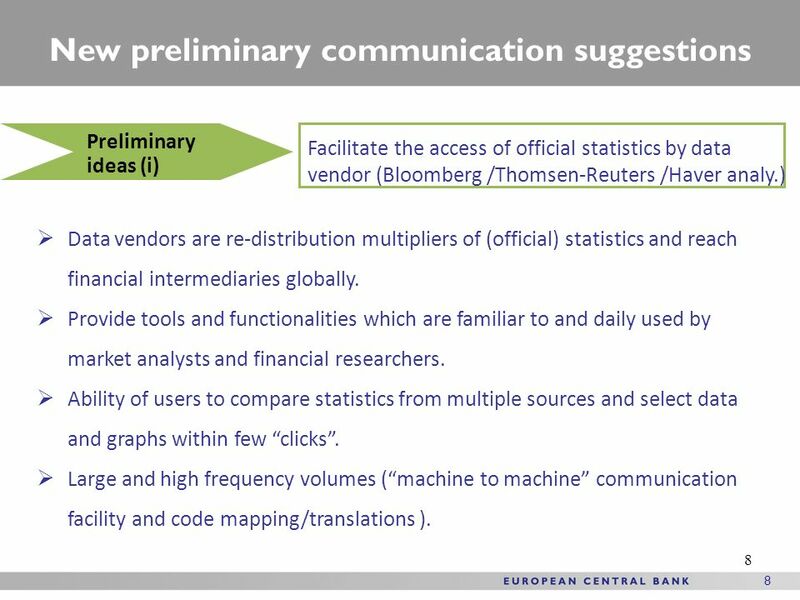 Data vendors are re-distribution multipliers of (official) statistics and reach financial intermediaries globally. Provide tools and functionalities which are familiar to and daily used by market analysts and financial researchers. Ability of users to compare statistics from multiple sources and select data and graphs within few clicks. Large and high frequency volumes (machine to machine communication facility and code mapping/translations ). 12 12 One size fits all ? 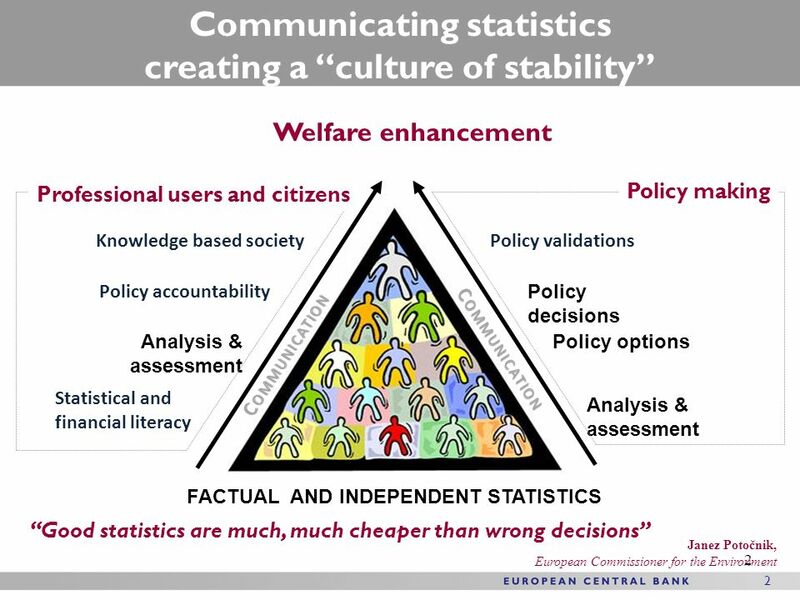 Conclusions Need to focus more on Communication of Statistics Ask frequent users for their needs (similar patterns) Focus on serving and supporting frequent users The more users understand statistics, the more use of statistics statistics will contribute to a culture of stability acceptance of policy decisions trust in statistics & institutions Join for common synergies in serving frequent users ! 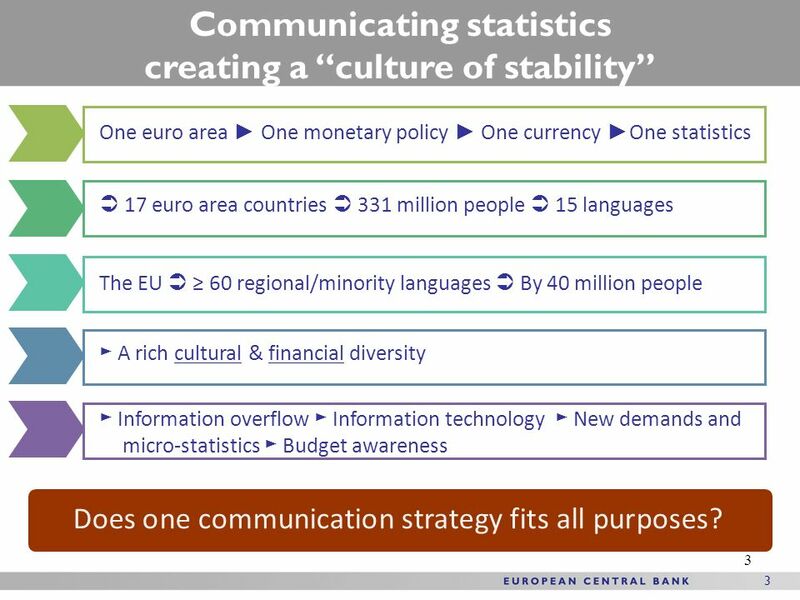 Statistics is technically disseminated and available – progress is made with incremental upgrades (web 1.0 to web 2.0), add-ons One euro area One monetary policy One currency One statistics One size fits all communication strategy? 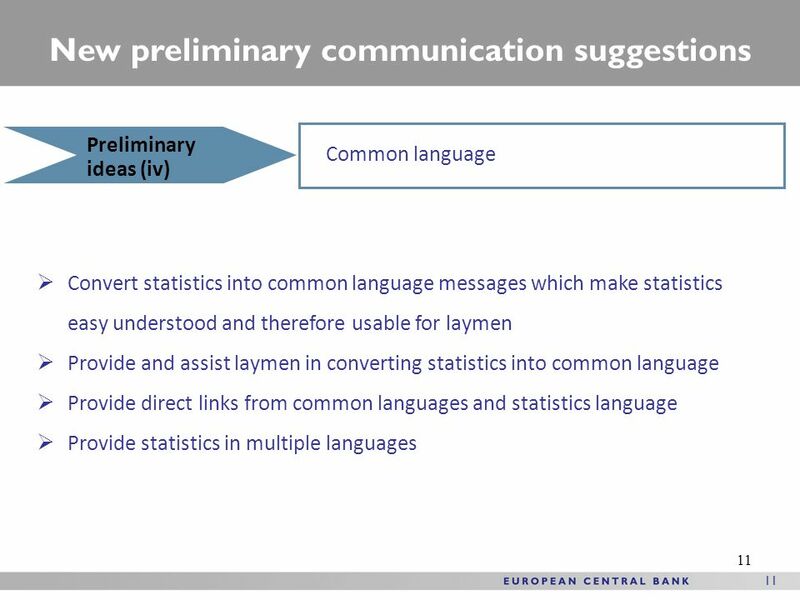 Download ppt "1 1 Werner Bier and Per Nymand-Andersen European Central Bank, Directorate General Statistics CCSA Special Session, Luxembourg, 8 September 2011 Communicating." UNITED NATIONS REGIONAL WORKSHOP ON DATA DISSEMINATION AND COMMUNICATION VENUE: Amman, Jordan DATE: 9th September, 2013 Presenter: GODWIN ODEI GYEBI Statistical. Strategies for web based data dissemination A strategy is a plan of action designed to achieve a vision - from Greek "στρατηγία" (strategia). Zoltan Nagy. Safety and health at work is everyone’s concern. It’s good for you. It’s good for business. Online interactive Risk Assessment Advisory Committee for Safety. 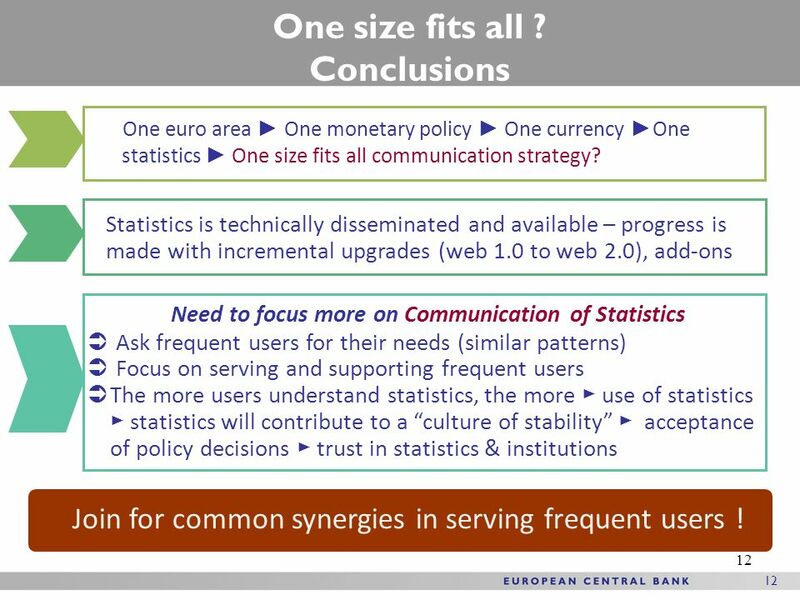 Benefits of integrated economic statistics for central bank users Richard Walton European Central Bank Berne, 6-8 June 2007. 1 1 Building the public image of statistics - The importance of user oriented dissemination Øystein Olsen Director General, Statistics Norway International. 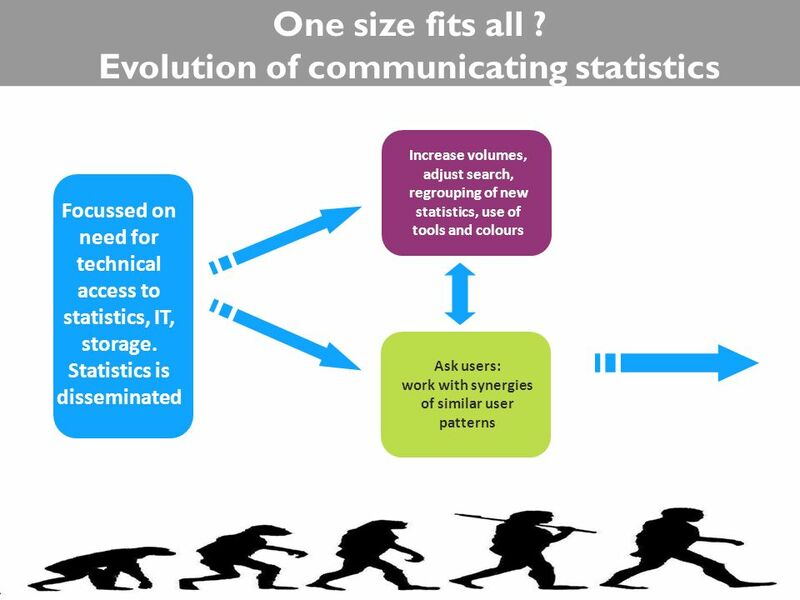 1 UNECE – Conference of European Statisticians Per Nymand-Andersen Berlin, May 2013 Communicating Statistics – making an impact Future ideas in communications. 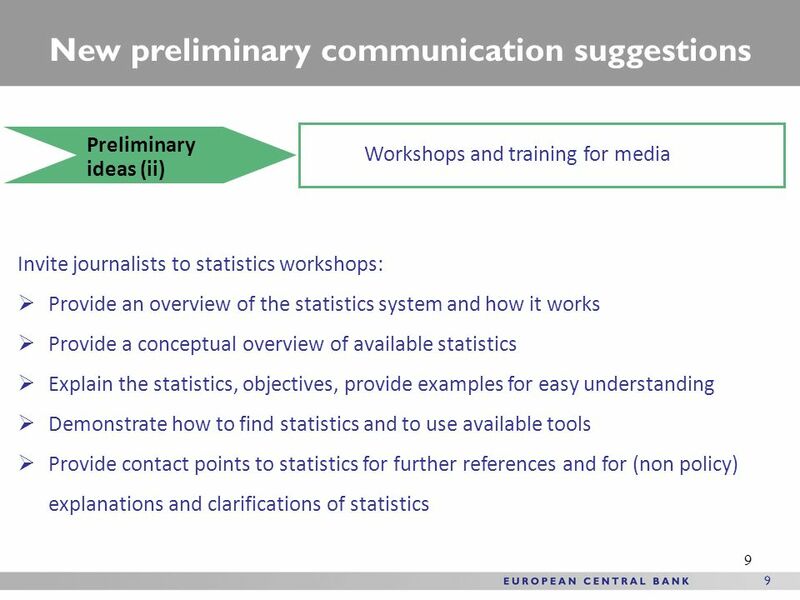 Turning statistics into knowledge Per Nymand-Andersen European Central Bank CCSA session on International Statistics Ankara, 5 S EPTEMBER 2013. Identification of critical success factors for implementing NLLS, through collaboration and exchange of expertise IDENTIFY LLP-2008-RO-KA1-KA1NLLS. 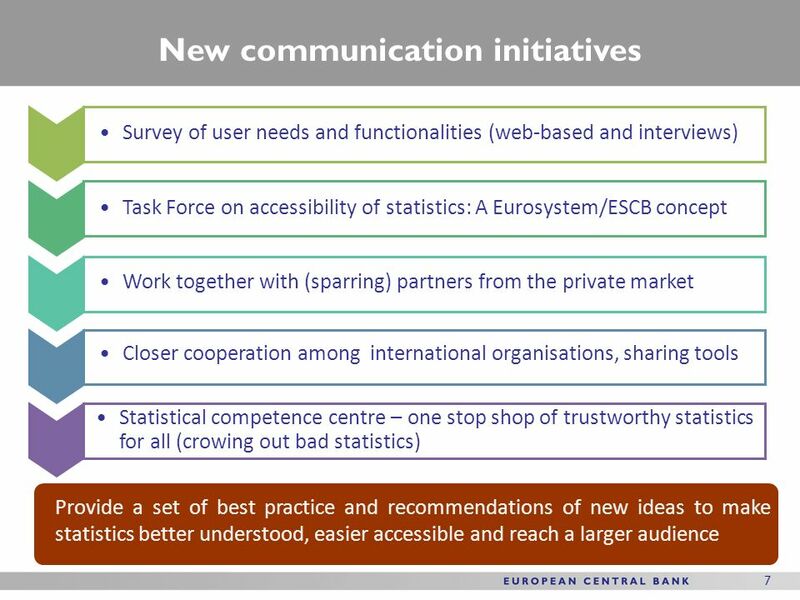 CBBH Cooperation Programmes with the ECB & Eurosystem 1/3 In the process of convergence with the EU standards and preparations for joining the European.